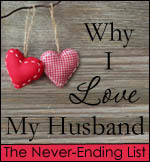 I was thinking of something mushy to write my husband about being in love with him but ended up thinking instead of how I just want to be wherever he is. I went ahead and shared my thoughts on Facebook but thought it’d be nice to share them here as well. Easily lost in the plethora of words that make up our language. Yet it’s one of the most significant words in my life. You see, home is more than a house. A refuge from the storm, a soft landing place. A place of belonging, an absence of fear. I turned my bit of doggerel into a graphic. Feel free to pin it, share it, email it, or print it. Please do not alter it in any way. 13. I have never been afraid of violence of any sort from my husband. In the 13 1/2 years we’ve been married, I can recall him raising his voice at me only once. 14. He knows my strengths and my weaknesses. And loves me through them all. 15. He wants me around. He misses me if I get overly busy with the kids, my work, the house, and all the other stuff I do. And he lets me know that he misses me, asking me to spend time with him. 16. He and I share the same love of adventure. We like to go camping, hiking, or white water rafting. I love equally as well our forays to amusements parks, NASCAR races, and incredible concerts. 17. He keeps my secrets. If I tell him something private or very personal, I never have to worry that he’ll share that with anyone else. I absolutely love your list! I’m getting to know your husband more and more each week and it feels so good to get a glimpse into such a sweet love. Happy Valentine’s Day to you both!